The most obvious reason to replace a gouge or chisel handle is because it has split and is, therefore, dangerous or difficult to use, but there may be corrective reasons such as making a more comfortable handle or realigning the metal shank with the handle. Deep down though, you may want to discard the generic handle to create a fine, heirloom quality tool - after all, what woodworker doesn't appreciate the patina of well worn wood, the lustre of brass, and the metallic richness of hand-forged steel? 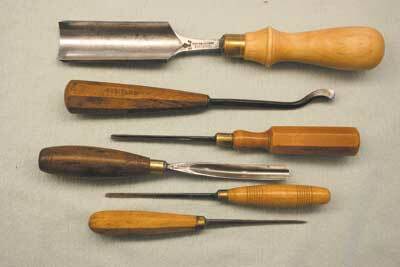 Not so long ago, one could purchase gouges and chisels unhandled in order to save initial cost - and the tool manufacturer couldn't be so inconvenienced - though sets of handled tools have been available since the 19th century. 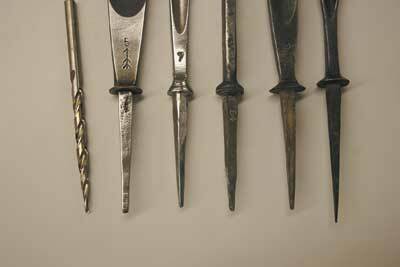 This may partly explain why older gouges have such an interesting variety in the 'style' of handles (see photo 1). One would think that purchasing gouges today would be virtually risk free, with contemporary expectations of quality control standards - Rockwell hardness scale and CNC milling for example. Sadly, this is not necessarily the case and you should be aware of the potential problems of new tools. 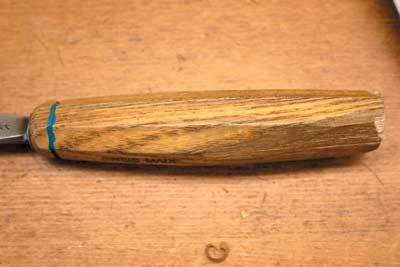 The woodcarver's gouge consists of a metal blade and a wooden handle. The metal blade is formed at one end of a shank; the other end, which is inserted into a wooden handle, has a tang which tapers to a point. 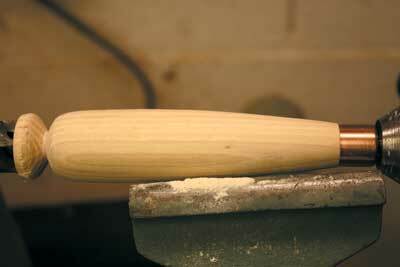 To prevent the splitting of the wood handle due to impact, a shoulder or bolster is formed on the shank. The bolster distributes the force to a broader area of wood and does not allow the tang to be driven deeper into the handle. The wood handle has a hole drilled in it to accept the metal tang. For smaller, more delicate tools, this is all that is required, while larger tools which are subjected to hand or mallet impact, usually have a ferrule. 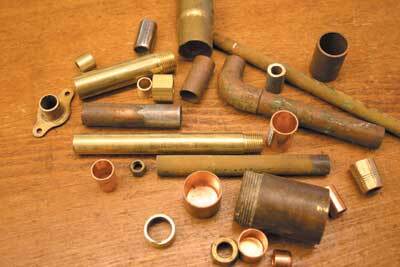 The ferrule is a metal band or cylinder which fits over the end where the tang is inserted, to prevent splitting. In the case of the largest tools used exclusively with a mallet, both ends often have ferrules. 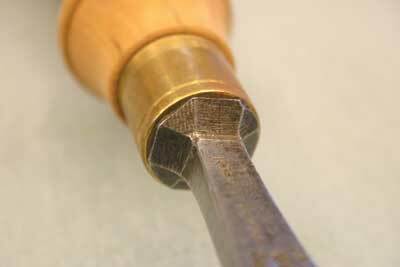 There are two common problems with the metal fabrication of carving tools regarding how they are assembled to the handle - this article doesn't address the blade end of the shank regarding the quality of steel or irregularities of sweep but looks at the handle itself. The first inaccuracy is that the tang deviates from the centre axis of the shank. This makes it difficult to insert the tang into the handle such that the shank and therefore the blade, is on the longitudinal axis of the handle (see photo 2). Using a tool whose shank significantly angles from the handle creates a disconcerting awkwardness when used alternately left- and right-handedly. The second common problem in metal fabrication is that the bolster does not have a good bearing surface; it should be flat and perpendicular to the shank. Some bolsters are so bulbous that their purpose is nearly defeated. If we look at photo 3, we can see how poorly-made the bolster is when contrasted with photo 4, with its neatly shaped bolster. Generic handles can also have properties which are less than ideal. 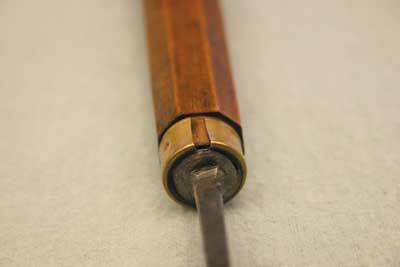 The grain of the handle can be angled from the centre axis inviting splits and even loss of wood (see photo 5). The latter problem usually creates a dangerously off-centre striking surface. Assembly of parts is often crude: faceted handles are often not eased into the round ferrule, creating uncomfortable projections, or the ferrule itself sometimes extends beyond the handle or bolster. This exposed rim also makes the tools tiring to use. Of course, the overall shape and size of the handle should be scrutinized for appropriateness and comfort. These shortcomings can be remedied with a few alterations to the metal bolster and properly made and fitted handles. Short of heating the tool and reforming the metal, one can use a mill file to alter the bearing surface of the bolster. With the shank held in a vice, file part of the bolster flat, then work around the tang to obtain a continuously flat disk. 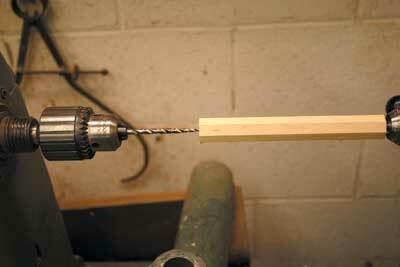 Take the tool out of the vice and sight from the side to determine perpendicularity. Correcting a poorly aligned tang will prove to be impractical, but can be rectified in the insertion procedure as explained later on. I would not attempt to straighten the tang by striking with a hammer unless you are confident that the metal is malleable and will not snap! There are three general considerations in making replacement handles: the use of appropriate woods; the design or shape; and the practicality of fabrication techniques. Most hardwoods may be used for smaller width gouges as these receive less abuse from mallet blows, while larger width gouges require woods which will withstand substantial blunt force - think of all the power of an extended arm and the weight of a mallet concentrated on a handle end smaller than the size of a dime! Photo 6 shows five gouges made from the following woods (top-to-bottom): boxwood (Buxus sempervirens), hickory (Carya ovata), ash (Fraxinus americana / excelsior), jabtoba (Hymenaea courbaril) and dogwood (Cornus florida). Cherry (Prunus sarotina) and walnut (Juglans nigra) can be used to differentiate small to medium gouges by colour. 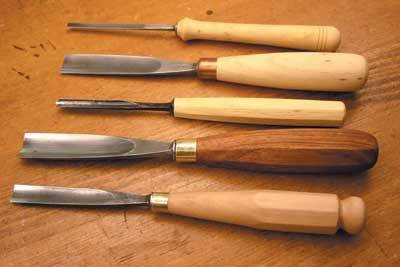 Boxwood lends a wonderfully smooth feel while carving, but is a little brittle for heavy work. The jatoba handle has a nice reddish colour and is a dense wood, lending weight to larger handles. 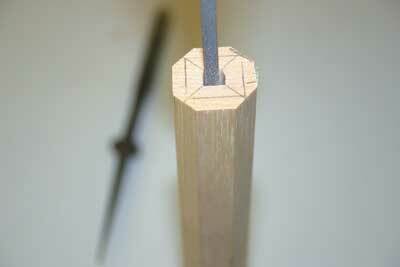 Dogwood is also a fairly tough wood which I frequently use for carving mallets. For larger gouges, hickory or ash is the wood often used for manufacturer's generic handles, and can be obtained from old sledge-hammer or pick-axe handles. Black locust (Robinia pseudoacacia) and hornbeam (Carpinus caroliniana) are also tough woods. Grain should be straight and parallel to the axis of the intended handle. 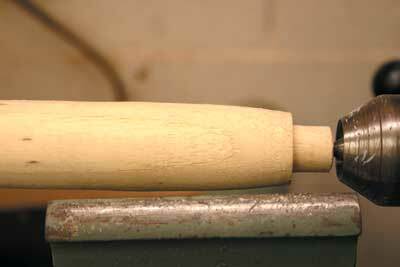 Riving handle blanks insures continuous grain, but this is sometimes difficult to do. Oak, which rives cleanly, is not the wood I would recommend, however. The next consideration is in the design of the handle which includes utility and comfort in use. Any serious carver values comfort and the need to sustain work over a period of hours. 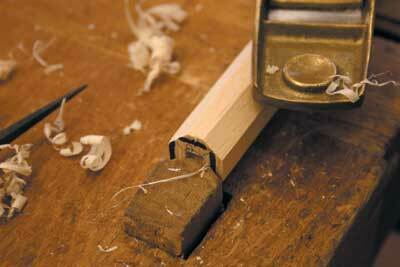 New gouges are fitted with several standard sizes which compromise the need for balance. Balance is not a literal point of balance, but a feeling obtained by experience that a tool has length, heft, and grip enough to function with ease. The handles illustrated in photo 16, though of different shapes, are appropriately sized for their blades and are comfortable to use. One could figure, no doubt, some proportional scale correlating mass of metal with length and diameter of wood, but this is putting too fine a point on the subject - besides, there would be exceptions and preferences which would thwart the intention of such a scheme. I tend to like longer, thicker handles for larger gouges, and smaller, pencil-like ones for detailing gouges, for instance. 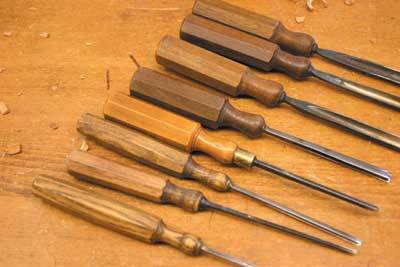 One may want to differentiate groups of gouges by differently shaped handles (see photo 7). 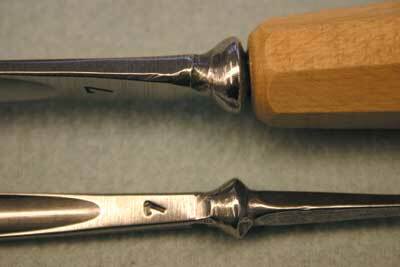 Generally, gouges are 230-255mm (9-10in) in overall length, with half being the handle. 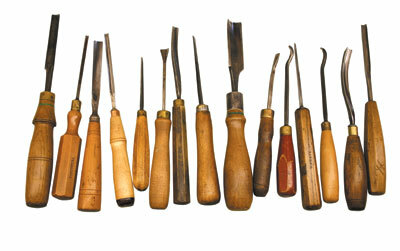 We are not addressing micro-tools or palm tools here, but standard carving tools. Factors such as width of blade, heft of shank, size of one's hands, and the type of work usually undertaken, may introduce exceptions to this rule of thumb. There are three basic types of handle design - turned, faceted and a combination of the two; there is a surprising variety within these groups (see photo 8). 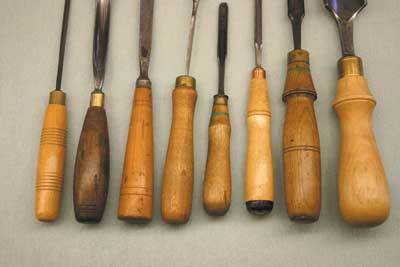 "Most new tools have a varnish finish which serves little purpose"